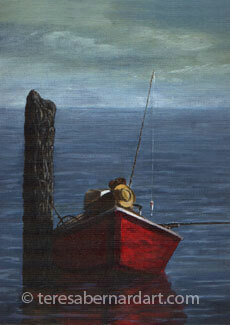 Description: A nautical theme painting with fishing boat fenders, chains and pier columns. Artist Comments: A still life (plural still lifes) is a painting in which the setting is composed mostly from inanimate objects. 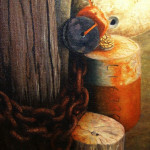 Still lifes can be made up of objects that are either natural, man-made, or a combination of both. Natural objects would be things found in nature, such as food, flowers, dead animals, plants, rocks, shells, etc. Man-made objects would be various items like drinking glasses, books, vases, jewelry, coins, pipes, ceramics, and so forth. In case you didn’t know, a boat fender is a type of bumper or cushioned buffer used to prevent a boat or other watercraft from bumping into a dock, pier or another boat causing damage to its hull. They are usually constructed from rubber, foam or plastic, and they come in a variety of shapes and sizes depending on what they are being used for. Artist Comments: Currituck Beach Lighthouse is located at Whale Head Bay in Corolla, North Carolina on the northern end of the “Outer Banks”. 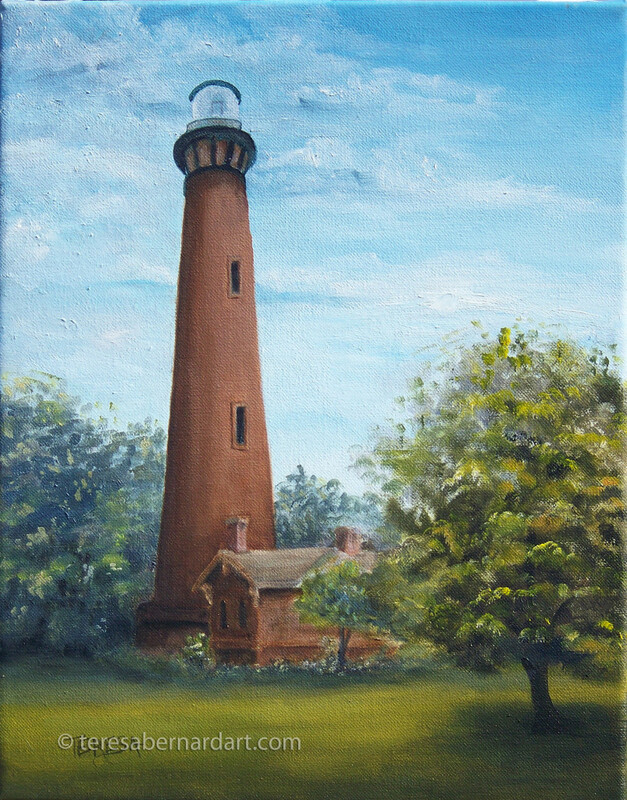 Its distinct unpainted natural red brick appearance is in contrast with fellow lighthouses along the North Carolina coast which are painted in striking black and white. Built in 1875, it is still used today to light the dark stretches of the southern Atlantic coastline. Annually the lighthouse welcomes an average of 185,000 visitors and we were among them. One summer my husband and I loaded up the kids and headed off for the Outer Banks to discover the lighthouses we’d heard so much about. We lived in Virginia at the time and was only two hours away from the OBX (Outer Banks). Currituck Lighthouse was our first stop and the favorite of all the lighthouses we visited that fun filled weekend. We were excited to discover that visitors can climb its 220 steps to the top and look at the spectacular view. We’ve been back to this lighthouse several times since that first trip and we always enjoy seeing this it over and over again. 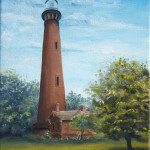 Find out more about Currituck Beach Lighthouse.  For more information about the Outer Banks of North Carolina, visit their website. 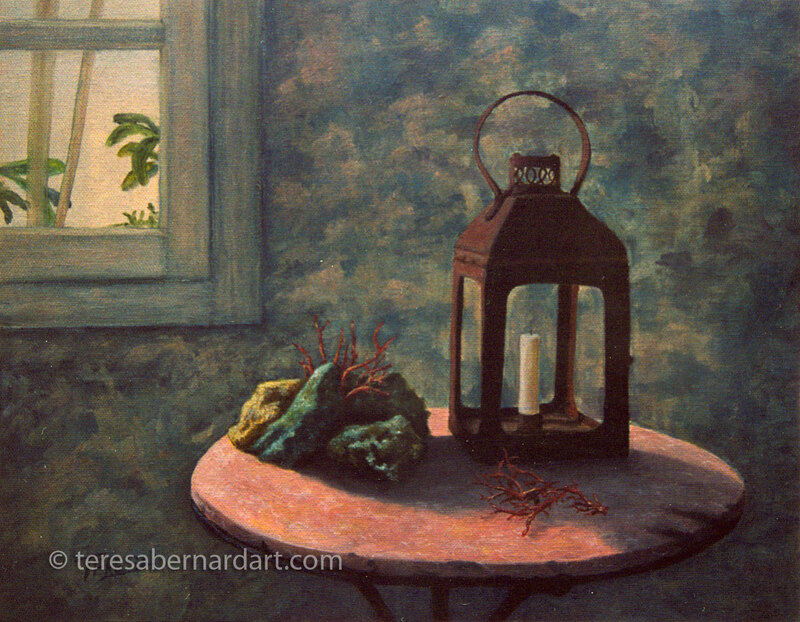 Description: A representation of a nautical themed still life featuring coral, a lantern with a candle, round pink marble table, and window in the background. 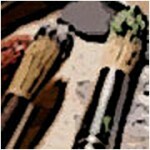 Artist Comments: Artists will often use reference photos to compose their paintings from. Sometimes they will create their composition from only one photo and at other times several photos are used. 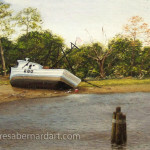 There’s nothing wrong with painting from photos, artist do it all the time. 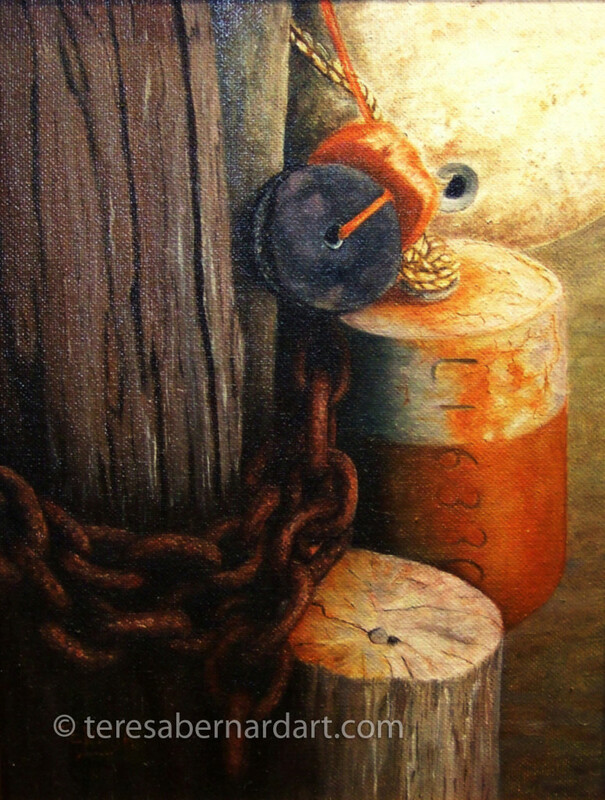 This still life painting is a combination of several such reference photographs which depicted the nautical elements I wanted to portray in my painting. One of those elements was coral. Coral can be found in so many different shapes, sizes and colors. Although, pinks and reds are the most common colors. They are tiny sea creatures which live in the ocean in large colonies that look like plants. They will live all of their adult lives in one place and prefer the places where the water is warmer. When they die their skeletons form a hard stony substance also called coral. Large deposits of coral often accumulate to form reefs or islands. I had never used coral in a painting before, so as I considered painting a still life with a nautical theme, I felt it would be very interesting to include some coral in this one. I’m happy with the way it turned out and I especially like the nautical lantern to finish out this marine themed still life. Description: A depiction of a famous Oregon coast lighthouse. 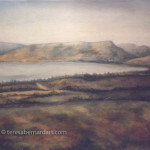 This painting sold to a private art collector in California. Artist Comments: I find Oregon to be one of the most beautiful places in America. Having lived there for a number of years, “The Beaver State” has inspired numerous paintings of its scenery. Heceta Head Lighthouse is one of those paintings. 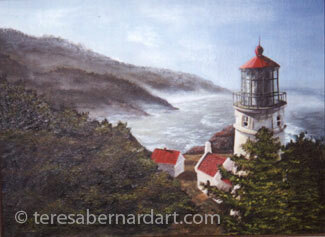 This oceanview oil painting is of the historic Heceta Head Lighthouse, built between 1892-1893. Perched high on a bluff approximately 150 feet above the sea, it stands watch over the Oregon coast 2 miles north of the famous Sea Lion Caves. Its beam can be seen for 21 nautical miles making it the strongest light on Oregon’s coastline. Heceta Head Lighthouse is a favorite place for tourists as it is one of the most-visited lighthouses in the United States. The lighthouse offers visitors easy access and an outstanding view of the Oregon coastline and Pacific Ocean. Although I no longer live in the Pacific Northwest, Oregon continues to be a source of inspiration for me. Below are two more paintings of Oregon. For more information about this seaside attraction, please visit this website. Description: An early painting by the artist depicting the Oregon coastline. 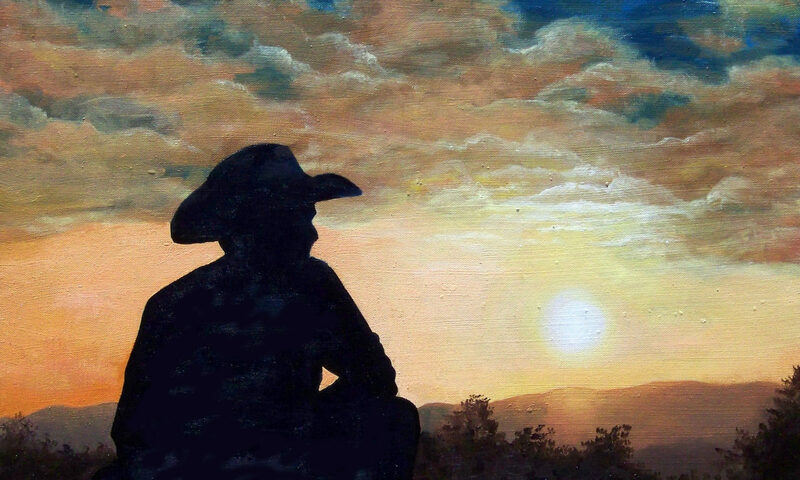 This painting is owned by the artist’s daughter and is part of a private collection in Texas. Artist Comments: This ocean wave painting is one of my early paintings just starting out as a professional artist. It shows the Oregon Coast looking south from the “Sea Lion Caves” towards Cox Rock. Cox Rock is one of thousands of islands which sits off the Oregon Coast. It is nearby to Sea Lion Point and Heceta Head. The Sea Lion Caves is America’s largest sea cave and is located about midway on Oregon’s 400 miles of shoreline. It can reach from the Pacific Coast Scenic Byway U.S. Highway 101. For more information about the Sea Lion Caves visit their website. There isn’t a lot of information about Cox Rock. What I have learned is it is an island off the Oregon Coast and which isn’t easily assessable if you want to explore it and it’s hard to find. Visitors to the island will probably want to use their GPS to guide them there. Coordinates are below. I used to live in Oregon and have found it to be one of the most beautiful places on earth to live and paint. 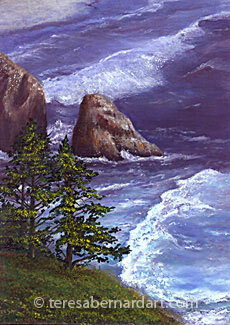 I’ve painted several paintings of Oregon scenery, some of which are listed below.